Telangana Inter 2nd Year result 2019: The TS Board Inter result 2019 has been declared by TSBIE. Students can now conveniently check their Telangana Intermediate result 2019 on TSBIE’s official websites - bie.telangana.gov.in and results.cgg.gov.in. In addition, students can also check their Telangana Inter result 2019 on the official website of JagranJosh – telangana12.jagranjosh.com. Soon after the official announcement of Telangana Inter 2nd year result 2019 by Janardhan Reddy, Secretary, Education Department, Govt. 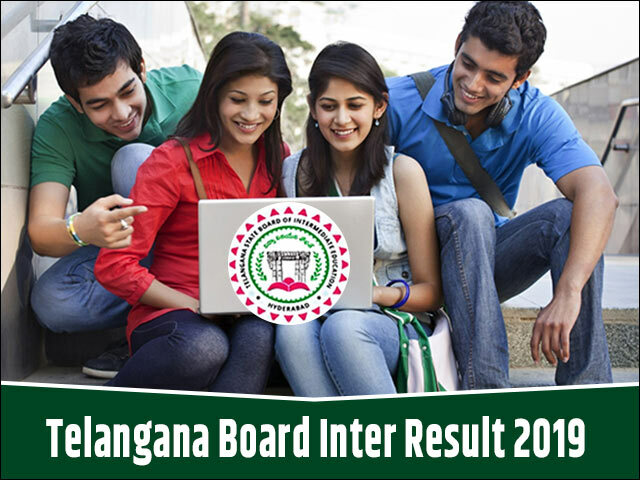 of Telangana, the results were published online. The declaration of TS Board Inter result 2019 online by the Board officials allows the students from across the state to access it with ease. The Telangana Intermediate result 2019 can be accessed by visiting the websites mentioned and entering the requisite credentials. With the TS Inter Result 2019 date approaching fast, students is bound to encounter a lot of speculative information and rumours. Such misinformation puts a lot of pressure on the students. To steer clear of this, students can rely on jagranjosh.com to get latest and verified news updates about the Telangana Board Inter Result 2019. Students can book mark this page and visit it regularly to get these updates. To get real-time updates and information about the TS Board Result 2019, students can also register for the e-mail alerts by filling the form provided above. How to check Telangana Board Inter Result 2019? Students will be able to view their official Telangana Board 12th Result 2019 on the official website of the Telangana Board. The result is said to be available online only. Students are advised to check their Telangana Board Inter Result 2019 either from the official website or from the link shared in this article. Jagranjosh will activate the link as soon as the Telangana Inter Results 2019 are declared. Now that candidates have their Telangana Inter Results 2019, it is important they check the details mentioned on the scorecard. In 2018, Telangana Board 12th Exam were conducted from March 1 to 19, 2018. The exam was taken by over 4.29 lakh students of which 67.06% cleared the Telangana Board 12th exam. The overall pass percentage stood at 67.25 with Komakaram Bheem and Medchal having highest number of students who cleared the Telangana 12th exam. Back in 2017, the Telangana Board Inter Results were declared in the second week of April. Nearly 4, 14,213 students appeared for the board exam. Of the total students, nearly 2, 75,273 students cleared the final exam with a passing percentage of 62.01%. Post the Telangana Board Inter Result 2019 are announced, there may be celebration for some while some may be disappointed with their performance in the exam. There are instances where a student may feel he had done better than the scores obtained, in such case he may seek for re-checking/ re-evaluation process that is offered by the Telangana Board. The r-evaluation and re-checking are important aspects with regard to the Telangana Board Inter Result that a student must keep in their mind. In case the students do not feel that their efforts have been truly justified in the scorecard, they can apply for re-checking / re-evaluation of the answer sheets. In case there is any change in the final mark tally, the same would be updated in the original mark sheet. The Telangana Inter Result 2019 may bring bad news for the students who do not score passing marks in the Telangana Board 12th exams. In such cases, they will be provided with another opportunity to prove themselves. The students will be able to appear for the Telangana Board 12th compartmental/ supplementary exam. The supplementary examination is likely to be held in the month of June and July. The same will be notified here in this article and also by the board on their official website. Students are advised to bookmark this page for any update on the Telangana Board 12th Result 2019; they can also fill in their details on the link shared in this article to receive notification in regards to the Telangana Inter Result 2019. After the declaration of Telangana Inter Result 2019, the colleges will kick-start the admission process to different undergraduate level programmes. For students, who want to opt for professional courses like Engineering and Medical, the entrance exams, which forms the second tier selection criteria has already been held. Keeping in mind the tight admission deadlines for UG admissions, students are advised to keep all the necessary documents related to TS Intermediate Result 2019. Colleges will ask for official TS Inter Result 2019 marks sheet / scorecard along with transfer certificate and other documents during the application filling state. Therefore, intermediate students are advised to keep these documents ready before the start of college admission after the declaration of TS Result 2019. Telangana Inter Results 2019 has been declared by TSBIE. Students will be able to check the Telangana 1st and 2nd Year Intermediate Result 2019 online on results.cgg.gov.in and bie.telangana.gov.in. TS Inter Results 2019 has been officially declared. Candidates can check the Manabadi TS Inter 1st and 2nd Year Result 2019 at bie.telangana.gov.in. TS Inter Result 2019: The official websites of Telangana Board have crashed due to heavy traffic. Students can now check their results on telagana12.jagranjosh.com and results.jagranjosh.com. Telangana Inter Results 2019 for 1st and 2nd year students have been declared. Students can check their TS Inter Result 2019 at results.cgg.gov.in and bie.telangana.gov.in. Telangana Inter Result 2019 for 1st and 2nd Year student expected on April 15 at results.cgg.gov.in. TSBIE will declare the Telangana Intermediate Result 2019 online on results.cgg.gov.in. Telangana Intermediate Result 2019 for 1st and 2nd year students will not be declared today. Know the exact date and time for TS Inter Result 2019 here. Telangana Open School Society (TOSS) has released the datesheet for class 12 exam on the official website telanganaopenschool.org. The exam will start from 24 April. Telangana State Board of Intermediate Education (TSBIE) is likely to release Inter First and Second Year result on 8 April as per some sources. Know the details here. The Telangana State Board of Intermediate Education (TSBIE) announced the Telangana Inter 1st year and Inter 2nd year result 2018 today on bie.telangana.gov.in and results.cgg.gov.in. The Telangana State Board of Intermediate Education has released the TS Inter Result 2018 today. The scorecards are now available on the official website i.e bie.telangana.gov.in. The Telangana Board 2018 Inter First Year Examination has now begun at different centers, all over the state. Girls outsmarted Boys once again in the recently announced TS Board Inter Results 2017. The Manabadi Results 2017 are now available live on bietelangana.gov.in and manabadi.co.in. Manabadi Telangana Inter Results 2017 for 1st year and 2nd year students to be announced today at 10 AM. Students can check online at websites bie.telangana.gov.in and manabadi.com. The Board of Intermediate Education, Telangana is going to announce TS Board Inter Results 2017 for 1st year and 2nd year students today. Students can check their Telangana Inter Results online on official websites bietelangana.gov.in and bietelangana.cgg.gov.in. The Board of Secondary Education, Telangana declared the TS Inter Supply Result 2016 today i.e., 23rd June 2016 at 3PM. After the formal declaration, the Telangana Intermediate Supplementary Result 2016 were made available to all students online on the official website bie.telangana.gov.in, results.cgg.gov.in. Telangana Intermediate Results 2016 will be declared by TSBIE on 22nd April 2016. Students can visit board’s official website bie.telangana.gov.in to get the results. Students are on top of the world, as the Board of Intermediate Education, Telangana has announced the Telangana Inter Result 2016 for 1st and 2nd year exam on 22 April 2016. Results announced :Here’s some good news for all the candidates who have been waiting for the Telangana Inter 1st Year Result & Manabadi Inter 1st Year Result 2016. The Board of Intermediate Education (BIE) Telangana is all set to announce the TS Inter Junior Result 2016 on April 22 at 11 AM. Candidates expecting their TS Inter 1st & 2nd ( Voc & GEN )Result can retrieve the same at the official BIE Telangana Result website as well as on partner websites. Telangana Board is going to release BIE Telangana 11th and 12th Class result likely on 22-04-2016 at 10:30 am. Students from general and vocational course should check first year TS IPE Results 2016 at official website results.cgg.gov.in. Or you can search other educational web sites like manabadi.co.in and schools9.com. All the regular students who completes your inter examination in the month of March, can able to check Telangana inter first year results 2016 by hall ticket number. Here’s a good news for all the candidates who have been waiting for the Telangana Inter 1st Year Result & Manabadi Inter 1st Year Result 2016. The Board of Intermediate Education (BIE) Telangana is all set to announce the result. Candidates expecting their result can retrieve the same at the official website of BIE Telangana (www.results.cgg.gov.in).